Sierra Leone Deputy High Commissioner to Nigeria Rtd. 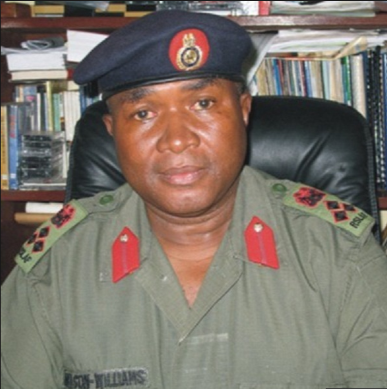 Major General Nelson Williams has been kidnapped in Nigeria. According to Embassy sources in Nigeria, He was kidnapped sometimes yesterday. “He left the Sierra Leone mission in Abuja and went to attend a military graduation ceremony in Kaduna. At 4am this morning, the embassy accountant received a strange phone call. It was the kidnappers. They placed Nelson-Williams on the line and after he identified himself to the accountant, the Kidnappers came back on the line and informed he was in their custody and they had kidnapped him and wanted a ransom demand of around 44 million Naira (about $150,000).”, the Embassy sources said. The kidnappers have now called the Embassy twice this morning threatening unsavory outcome if their ransom demand is not met. According to sources, one of the calls had Nelson Williams sounding very low and frightened. The whereabouts of his driver (and those he was supposed to be with on the said trip), is presently unknown. The exact details of how the kidnap happened is currently unknown. The Nigerian Police, Intelligence Service and Foreign Office in Nigeria are now working with the Sierra Leone Embassy in Abuja to investigate the matter. The Nigerian military has also been informed. Nelson Williams was a former Head of the Sierra Leone Armed Forces. In a related development, Unknown gunmen have kidnapped two Indian Expatriates in Gboko local government area of Benue state. According to reports, Sharma and Srinivas were travelling to Dangote Cement Plc Plant in a car from their residential quarters at around 7.20 pm on Wednesday when a group of armed men kinapped them at a traffic signal. The wife of one of the nationals said her husband is a civil engineer and has been working for Dangote Cement in Gboko for the last three years. “I tried to reach my husband on Wednesday but could not contact him. I called up the officials of the Plant this morning and they informed me about kidnapping,” she said. The police have launched a search operation, however, Benue State Governor, Samuel Ortom urged his Security Adviser, Col. Edwin Jando to step up efforts to ensure that the expatriates are released unharmed. Meanwhile, the Ministry of External Affairs and Indian embassy in Nigeria have been contacted about the development.